Summertime in Columbus, Ohio, means an abundance of long, sunny days that almost always include plenty of heat and humidity. When the temperature rises, a fun place to get a little relief is at one of the water parks in the area. 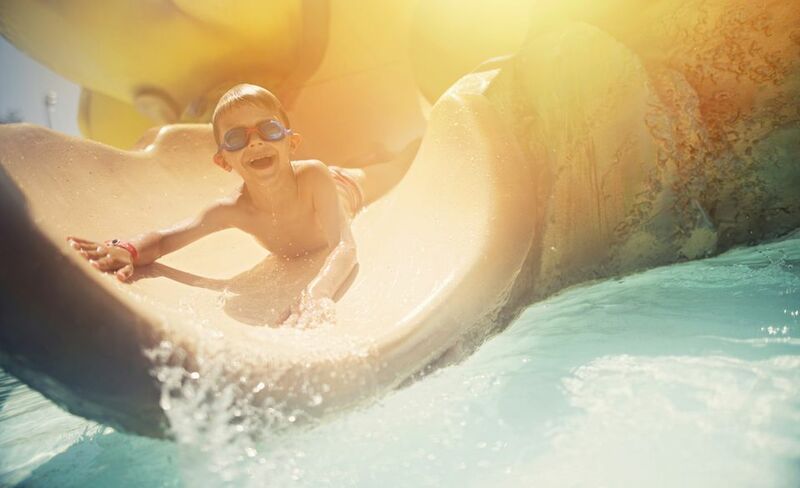 But you don't have to limit this kind of splashy fun to summer—some indoor water parks are open year-round. If you're going to be in the Columbus area on vacation, gather up the kids, swimsuits, sunscreen, and some snacks and head out to one of these great summertime (or anytime) spots. Part of the Columbus Zoo and Aquarium complex, Zoombezi Bay is one wild outdoor water park. The entire site covers 22 acres and includes 17 waterslides, a wave pool, action river, lazy river, kiddie play pool, and private cabanas. Dolphin Dash: Up to six guests can compete in this head-first, mat racing, high-speed attraction that starts from a 49-foot tower. This slide has a length of 310 feet and is longer than a football field. Cyclone: Dropping from a 55-foot start to reach exhilarating speeds of 20 mph, this extreme four-person raft cruises into the largest enclosed reducing-radius tunnel in the world. The Cyclone stretches 209 feet in length and is sure to be the most exciting ride in the park. Raft transport is complimentary and starts from the same tower as the Tahitian Twister. Spending the day at this water park will surely work up an appetite; there are 10 restaurants to tempt your tummy, including an adults-only cocktail area. This year-round 50,000 square-foot indoor water park inside the Cherry Valley Lodge in Newark, Ohio, 40 miles from Columbus, is kept at 84 degrees. Special rides include Parrot’s Perch, a zero-depth entry area for swimmers under 48 inches. Don't miss Coral Reef Cavern, a 1,000-gallon activity pool with lily pads, water basketball, Quest Arcade, and an animated coral reef backdrop. Don't forget to bring your towel from home in an effort to help keep the resort green, as towels are not provided for guests. If you're staying at the hotel, you can simply snag one from your room. Reed Road Water Park, in Upper Arlington, Ohio, about 6 miles from Columbus, is part of the city's aquatics division. It's open from Memorial Day weekend to Labor Day. The water park has heated water, a diving well, a vortex and current channel, and waterslides. In addition to waterslides and play areas, Reed Road Water Park also offers concessions and shaded areas. You can purchase a seasonal or daily admission pass, depending on how often you plan to visit. Splash Harbor, inside a Comfort Inn in Bellville, Ohio, has a 49-foot looping water slide, dumping buckets, shooting geysers, water basketball hoops, and a floating raft and kids pool area. With a room reservation, four water park passes are included. Hotel guests also receive free continental breakfast and have access to an arcade, fitness area, and bicycle rental for a 20-mile bike path next to the hotel. Bellville is 62 miles from Columbus.